Find hotel near Museum Of Greek Folk Musi ..
With a collection that goes beyond 1200 Greek popular instruments, the MELMOKE boasts of being one of its own kinds in Athens. Established in 1991, this museum houses collection that has been carefully researched and studied by the musicologist Fivos Anoyanakis. What makes this museum different is that these instruments have not been chosen out and categorized for their aesthetic value but for their ethnological and musicological interest. Spread over three floors, this museum will keep you engaged with the different kinds of vibrations and sounds that ultimately contribute to music. What makes this museum even more interesting is that it is housed in an old Athenian mansion built in 1842 by general Lassanis, one of the heroes of Greek war of Independence. 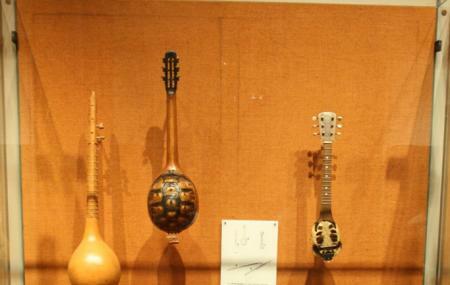 How popular is Museum Of Greek Folk Musical Instruments? People normally club together The Temple Of Artemis Orthia and Temple Of Aphaia while planning their visit to Museum Of Greek Folk Musical Instruments. Free, concise, and well laid out. The museum isn't very large, but they do a good job of presenting a lot of historical instrument usage. More instruments than description (but everything is labeled). Also a nice bathroom. The opening hours on Google are incorrect. The museum is closed on Tuesdays. It's open Monday, Wednesday to Sunday from 8:30-15:30. I wasn't able to visit the museum but wanted to let others know the correct opening hours. Wonderful place to see. Very old musical instruments. Very interesting collection of Greek musical instruments. I appreciate that headphones are there for people who want to listen to the sounds of the instruments. Some headphones were not working. But can’t complain because it’s a free exhibit. All in all a must-go for music buffs. Nice collection of instruments and audio and video samples. Free entrance. Not crowded. In the center of Athens.